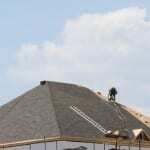 Our roofers are known throughout Alliston for the quality of their workmanship. A house isn’t a house unless it has four walls, a floor, and a roof. At Slippery Slope Roofing, we realize what a vital component your home’s roof is, and we are here to help you preserve it with our roofing services, including repair, maintenance and installation. Our goal is to exceed your expectations whenever you call on our roofers in Alliston, Ontario and to ensure you are more than happy working with us. We work with precision from day one to the completion of the project to ensure no mistakes compromise the integrity of the roof. We communicate with the client throughout the duration of the project, so they always feel confident and informed. We make sure our work area is always organized and thoroughly clean it up after we are done working on the roof. We guarantee we will do all of these things for you when we come to work on your home’s roof. Plus, we won’t stop working until you are pleased with our workmanship, so you feel confident knowing your roof is in top shape moving forward. It’s time to work with a team of roofers you can trust. To find out more about the services we offer or what sets us apart, get in touch with us at Slippery Slope Roofing today.